Winter Ascent of Triglav by the Slovene Route in Triglav North Face. We offer day and multi-day tours in the Slovenian Alps and further afield, as well as weekend ski tours and ski touring courses. We will select a tour appropriate to your current skiing level and physical condition. This kind of experience certainly does not let down anyone, and you cannot remain indifferent when you see the reflections of the mountains in winter. From November to April – depending on snow conditions. 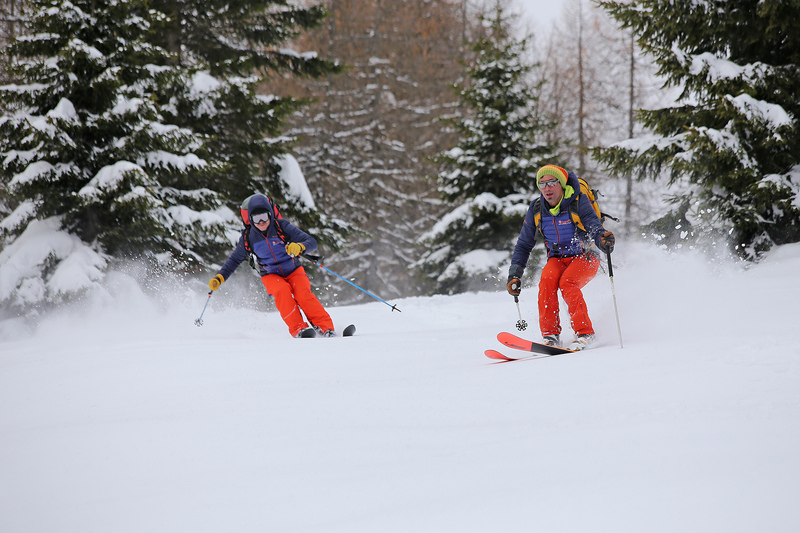 Day and multi-day ski tours. Slovenian and other European mountains. Weekend GROUP tour trips (1 day) – €60 per person in Slovenia, €70 per person abroad (Austria, Italy, or up to 200km one way). The above prices apply to weekend GROUP tours (1 day) and easy tours with a minimum of 4 participants for the .Slovenian mountains or a minimum of 5 participants for tours to mountains outside of Slovenia. Price includes guiding, transfer, avalanche safety equipment and costs incurred by the guide. Easy tours for 1-6 people: 1 day guided tour in Slovenia – €290; 1 day guided tour outside of Slovenia (Austria, Italy, or up to 200km one way) €360. Moderate tours for 4 people: 1 day guided tour in Slovenia – €350; one day guided tour outside of Slovenia (Austria, Italy, or up to 200km one way) €400. Difficult tours for 2 people: 1 day guided tour in Slovenia – €390, one day guided tour outside of Slovenia (Austria, Italy, or up to 200km one way) €520. We offer participants in our tours a 15% discount on service of touring skis. Bookings should be made a minimum of 2 days in advance.